Officials in Malawi say 56 people have died there. News24 reports Africa now has an 'inland ocean' where villages once stood, while women, children and babies are stuck in trees waiting to be rescued. 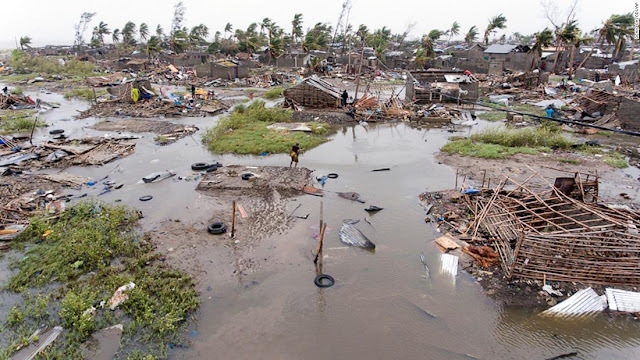 According to the Red Cross, the cyclone damaged or destroyed 90% of Beira. "We have never had something of this magnitude before in Mozambique," said Emma Beaty, coordinator of NGO grouping Cosaco. Fears are growing that the humanitarian crisis in Mozambique, Zimbabwe and Malawi could further intensify, with torrential rains in the region expected to continue into Thursday, and flood waters set to rise. As well as the immediate threat caused by flooding, hunger and illness are growing concerns, with crops and wildlife destroyed and waterborne diseases likely to spread.